At Katsuyama sake brewery, traditional recipes meet modern techniques. Steeped in more than three centuries of tradition and with only a tightly controlled group of four allowed to handle it, Katsuyama sake is amongst the best in Japan. And at a recent dinner inside the legendary Park Hyatt Tokyo, Katsuyama’s current owner, Heizo Isawa shared some of the secrets that have kept his sake held in such high esteem since its samurai founding in the 17th century. Wearing light blue tie dotted with white elephants under his happi at dinner, Mr. Isawa epitomizes the way he operates his business: Traditional techniques shot through with modern ideas. Take, for instance, the way the sake is served: We drank it from wine glasses with stems, which Mr. Isawa says is the “new style,” more suitable for sake. He says that he’s trying to develop an entirely new type of glass that is specific to sake, but since he hasn’t had much luck coming up with right design yet, he suggests that sake drinkers eschew the traditionally used palm-sized cup in favor of a wine glass in the meantime. In other ways, though, Mr. Isawa is a traditionalist: He praises the established technique of carefully polishing the rice used to brew sake, and their Gen sake is still brewed using the same 300-year-old recipe. To ensure that their sake maintains the high quality standards it’s known for, Katsuyama has remained a small operation: The brewery produces just a single barrel of sake per week with its 12-person staff. Polishing the rice, called seimai, when the outer layers of the rice are removed, is essential to sake brewing. The rice is harvested brown, but as much as 50 percent, and in the case of Katsuyama, even more, of the rice is polished away from the grain until it appears shiny. This must be done carefully, so that the shinkpaku, the center of the grain that is used in the sake, is not polished away and the grain is not broken. Meticulously polished rice is one of Katsuyama’s signatures. Their daiginjo sakes, the variety with the highest polishing rate are standouts. 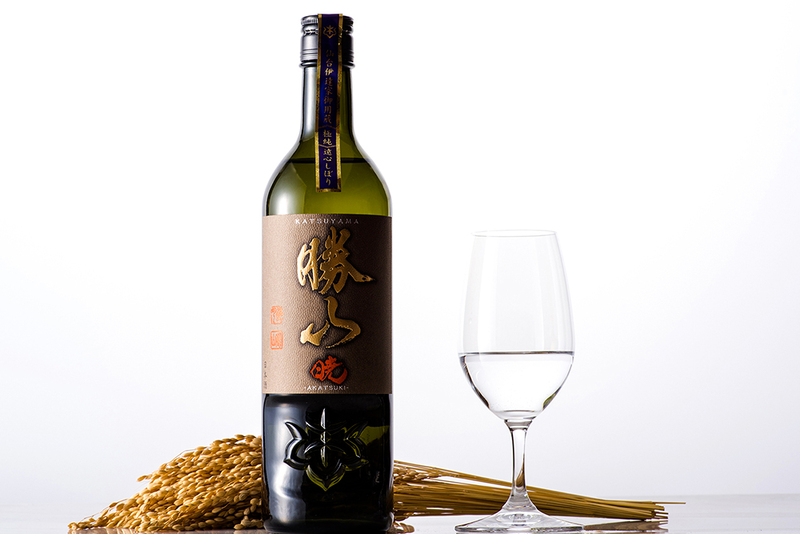 This type of sake has the highest polishing rate: At least 50 percent of the grain of rice must be polished away for it to qualify; in several of the Katsuyama daiginjo varieties, only 35 percent of the grain of rice is left over after polishing. Mr. Isawa, who has made it the mission of his brewery to bring out sake’s umami flavor, calls this sake variety “arrogant,” and indeed they do taste more pungent. The taste of alcohol is strong, giving it almost salty or sour taste with a fruity undertone that gives the sake a much-needed twinge of sweetness, and a thick, full texture on the tongue. Drinking Den, one of their daiginjo sakes, reminded me of eating durian—although the smell is…less intense. Their Lei sake on the other hand, best used for kanpai, or the toast at the beginning of the meal, is refreshing and light, without tasting weak. It’s dry, not too sweet, and gentler on the taste buds, going down almost like a fragrant glass of rose water—perfect for a beginner sake drinker. Mr. Isawa’s new ideas are what continue to get the brewery recognition, though. Their technique of separating the cultivated rice—known as koji—in a centrifuge and then extracting the resulting liquid off the top at 5 degrees below Celsius without exposing it any contact with the air is unique to Katsuyama. The process results in very little oxidation, allowing it to be stored for up to two years as opposed to the usual six months. These modern brewing techniques have won Katsuyama high praise from their peers. Their Ken was recognized in sake world championships in both 2015 and 2016 and you can now find their products in 17 countries. During the evening, Mr. Isawa described his award-winning Ken sake as “Audrey Hepburn”—an elegant, timeless classic—to the laughter of the diners, but the analogy works: Katsuyama brewery will probably hold up just as well to history as Hepburn did, standing out as a proof that sake—one of the standard-bearers of traditional Japanese food culture – can have it’s moment in the modern era, too.